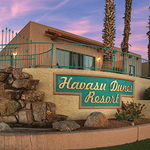 Stay on the shores of stunning Lake Havasu and enjoy all the fine amenities you'd expect from a lakeside resort, including fine dining and lodging adjacent to boat rentals and some of the best golf courses in Arizona. 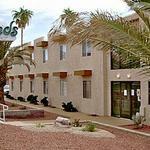 Your stay at a Lake Havasu City lakeside resort will give you the freedom to fully immerse yourself in the laid-back lifestyle that makes Lake Havasu tick. You can even bring Fido along, as some of our lakeside resorts happily offer pet-friendly rooms. What makes our lake resorts different? What doesn't? 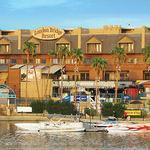 Unlike other Arizona lakeside resort destinations, you can spend the day jetting across the clear blue waters of Lake Havasu and then pull right into a private marina for dinner and drinks. Relax poolside or stroll over to the links for a round of golf. Our lakeside resorts are right in the middle of Lake Havasu City, so you're never far from prime shopping in the English Village, entertainment at theaters and museums and an exhilarating nightlife with bars and nightclubs, including the largest dance club in the Southwest. 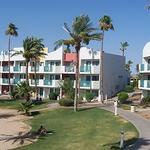 This 42 unit resort is all suites with 1 or 2 bedrooms and full kitchens. 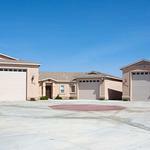 Free WiFi, tennis and basketball courts, pool, Jacuzzi and covered parking are included. The rooms and suites showcase the hotel's waterfront setting with unparalleled views and direct access to the Bridgewater Channel and London Bridge with contemporary furnishings, private balconies and in-room internet access. 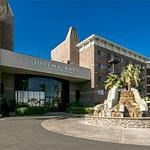 Centrally located along the shoreline of Lake Havasu. Featuring 122 elegantly appointed deluxe suites and 3 swimming pools, restaurants, bars, business center, fitness center, Bridgewater Links Golf Course, and free WiFi. 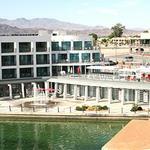 Located on the island, Lake Havasu's only beachfront resort features 139 lakefront suites, a heated Caribbean style pool with palapa bar, 3 restaurants and bars, boat launch, beach and dock boat parking, water park, business center, the Island Golf Club, walking and biking trail and watersports rentals.